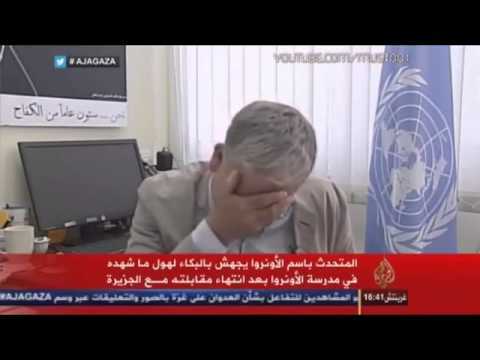 UN Official Breaks Down on Camera: "Children Killed in their Sleep - a Source of Universal Shame"
‘After a United Nations-run school sheltering more than 3,000 Palestinians was shelled early Wednesday, UN official Chris Gunness could not contain his grief while on camera with Al Jazeera Arabic. “The rights of Palestinians, and even their children, are wholesale denied… and its appalling,” Gunness, spokesman for the UN agency for Palestinian refugees (UNRWA), told Al Jazeera Arabic from Jerusalem. The interviewer appears to thank him for appearing, upon which Gunness breaks down and weeps. Gaza’s Ministry of Health said at least 17 people were killed and 90 wounded by the school shelling. An Israeli military spokesman told the New York Times that Israeli troops did not target UN facilities, but did respond to Palestinian militant fire from nearby the school in Jabaliya refugee camp.